Are you exercising at the right intensity? Using heart rate zones allows you to gear your cardio workout to the best intensity to get the results you want. You will know whether you are putting enough effort into your workout. If you know your maximum heart rate (MHR) you can use heart zone training to gear your workout to the correct intensity. Your maximum heart rate is as fast as your heart can beat. This varies for each person, but age is generally used as a guide for what your maximum heart rate is likely to be. A more individualized number can be provided by testing by an athletic trainer, or as a function of some of the more expensive heart rate monitors. You can use an age-based heart rate chart to see your maximum heart rate and also find your target heart rates based on percentages of the maximum heart rate. The healthy heart rate zone is 50 percent to 60 percent of your maximum heart rate. This is an easy and comfortable zone to exercise in. It's considered to be the lower end of the moderate-intensity zone. You will be able to carry on a full conversation in this zone, although you may be breathing a little heavier than usual. Your workout in this zone is less intense and won't give the most cardiorespiratory training benefits. But studies have shown that it works to help decrease body fat, blood pressure, and cholesterol. In this zone, the body derives its energy by burning 10 percent carbohydrates, 5 percent protein, and 85 percent fat. Walkers are often in this zone unless they press themselves to walk faster. If you exercise in higher heart rate zones, taking a healthy walk in this zone is a good way to enjoy an easy recovery day while still being active. The fitness heart rate zone is from 60 percent to 70 percent of your maximum heart rate. This is the higher end of the moderate-intensity exercise zone. You will be breathing heavier but will still be able to speak in short sentences. You burn more calories per minute than in the healthy heart zone because the exercise is a little more intense. You are going faster and therefore covering more distance. The calories you burn depend on the distance you cover and your weight more than any other factors. In this zone, your body fuels itself with 85 percent fat, 5 percent protein, and 10 percent carbohydrate. You get the same health benefits and fat-burning benefits as the healthy heart zone. An example of a workout in this zone is a brisk walking workout. The aerobic heart rate zone is from 70 percent to 80 percent of your maximum heart rate. You are now in the vigorous-intensity zone. You will be breathing very hard and able only to speak in short phrases. This is the zone to aim for when training for endurance. It spurs your body to improve your circulatory system by building new blood vessels and increases your heart and lung capacity. Aiming for 20 to 60 minutes in this zone is believed to give the best fitness training benefits. In the aerobic zone, you burn 50 percent of your calories from fat, 50 percent from carbohydrate, and less than 1 percent from protein. With the increase in intensity, you burn more calories in the same amount of time, as you are covering more distance in that same time. The calories you burn depend most on distance and your weight. If you go farther in the same amount of time, you burn more calories per minute. You would typically be in this zone by running or cycling, but you could achieve it by racewalking or walking fast for an aerobic walking workout. The anaerobic heart rate zone is 80 percent to 90 percent of your maximum heart rate. You will be unable to speak except a single, gasped word at a time. This intense exercise will improve the amount of oxygen you can consume—your VO2 maximum. This exertion level takes you to the limit where your body begins to produce lactic acid. Runners, cyclists, and racewalkers use this zone to build their ability to go even faster. Workouts in this heart rate zone should be in the 10-20 minute range or part of an interval training workout. You burn more calories per minute than with the lower heart rate workouts, as you are covering more distance per minute. The body burns 85 percent carbohydrates, 15 percent fat and less than 1 percent protein in this zone. The top zone is from 90 percent to 100 percent of your maximum heart rate. You can't go any higher, and most people can't stay in this zone for more than a few minutes. You will be unable to speak except for gasping single words. Which zone should you work out in? It is best to vary your workouts for length and intensity and allow a recovery day between days of intense exercise in the aerobic, anaerobic, and red-line zone. A training program will often have shorter workouts of higher intensity two to three days per week, alternating with a recovery/rest day. One day of a longer workout in the fitness or aerobic zone is often used to build mileage towards a race such as a 10K, half-marathon, or marathon. Tuesday: Interval workout in the aerobic to anaerobic zone with 10 minutes warmup at easy pace, intervals of 30 seconds sprinting followed by two minutes of recovery, repeated eight to 12 times, cooldown of 10 minutes at an easy pace. Wednesday: Recovery day with a workout in the fitness zone for 30 to 45 minutes. Thursday: Interval workout in the aerobic to anaerobic zone with longer intervals of eight minutes at a vigorous intensity and two minutes of recovery, repeated three to four times. Friday: Recovery day with a workout in the fitness zone for 30 to 45 minutes. Saturday: Steady-state (tempo) workout in the aerobic zone for 20 to 30 minutes after a warmup of 10 minutes. Sunday: Distance workout in the aerobic heart rate zone. Take your heart rate five minutes after the start of your exercise session and take it again before you go into your cool down. Your heart rate will slow if you stop moving, so it is important to check your pulse quickly if using the manual method or a pulse monitor, counting for only 10 to 15 seconds. You can find your pulse at your neck (carotid artery) or wrist (radial artery). Use a finger rather than your thumb to find the artery and the pulse. You will need a timing device that shows seconds, so switch to stopwatch mode on your smartphone clock or use a watch, clock or timer that has a second hand. Use two fingers and do not use your thumb as it has its own pulse. It is often easiest to find your pulse in the carotid arteries, which are on either side of your windpipe. Start feeling for it just beneath your jaw, next to your windpipe. Once you locate the pulse, press lightly. Count your pulse for 10 seconds and multiply by six, or count for 15 seconds and multiply by four. You may need to stop to do this at first, but once you are able to locate it, try to keep walking slowly or marching in place while taking your pulse to keep it from slowing. ﻿20 beats for 10 seconds = 120 beats per minute. 20 beats for 15 seconds = 80 beats per minute. You can also use a mobile app, such as the Azumio Instant Heart Rate app. It uses your cell phone's camera flash to read your pulse from your finger. Heart rate monitors with a chest strap are more accurate than taking your pulse. They transmit the data to a wrist unit or a mobile app so you can see your heart rate throughout your workout. Models include many other features with increasing price, such as tracking your heart rate zones, stopwatch features, calories burned and more. Other kinds of heart rate monitors include pulse monitors where you place one or two fingers on a sensor for a reading. Many treadmills and other exercise machines have grips with pulse sensors built in. You grip them and your pulse will read out on a display on the machine. You usually will not have to interrupt your workout to get a reading. 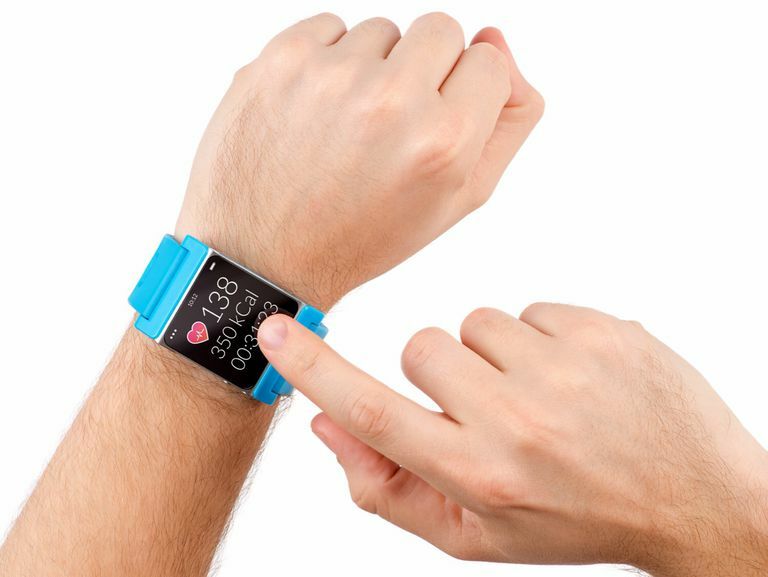 Some fitness bands, such as some models of Fitbit, and smartwatches such as the Apple Watch have LED pulse sensors on the underside next to the skin. These must be worn securely against the skin in order to get a stable and accurate reading. To save battery life, many of them don't read continuously. See the instructions for your monitor or watch to see how to get an on-demand or continuous pulse reading. These devices often have simplified heart rate zones, such as light, moderate, and vigorous. Some allow you to set a target heart rate and have a visual or auditory alert when you are in your chosen zone. You will be able to get more from your workouts when you understand how your heart rate indicates your exercise intensity. You will know whether you are achieving moderate or vigorous intensity and you can vary the types of workouts you enjoy. Exercise: Measuring Intensity. American College of Cardiology. https://www.cardiosmart.org/~/media/Documents/Fact%20Sheets/en/abk5262.ashx. Target Heart Rates. American Heart Association. https://www.verywell.com/maximum-heart-rate-1231221.